2.1 How do I Register/Activate my software? All of our Current Interfaces have Activation built-in, so VCDS should always be Fully Activated once it has been tested on a car. If you have an older Interface without built-in Activation, or have purchased an Interface somewhere other than Ross-Tech, click here for Activation instructions for VCDS-Lite. All of our Current Interfaces have Activation built-in, so VCDS will always be Fully Registered/Activated. If you have an older Interface without built-in Activation, or have purchased an Interface somewhere other than Ross-Tech, VCDS-Lite will operate in Shareware mode until it is Activated. The differences between Shareware and fully registered/activated versions are listed near the bottom of each function page in the Online Demo / Manual and in the Function Chart. 2.3 Is Product Support included in the price? Absolutely. If you have a question or problem, please post it in the Ross-Tech Foum, mail it to us directly, or give us a call. However, please understand that we don't know everything about every VW/Audi/SEAT/Skoda ever made. Information about telephone tech support for diagnostic questions can be found here. 2.4 Why can't I get VCDS to communicate at all? Is the adapter plugged into the car? An Serial Interface that is not plugged into the car will always be "Not Found". It gets power from the car! Is the car's ignition switch in the ON position? Is it plugged into the correct serial port? Some PC's have the ports mis-labeled. Are the serial ports on your PC properly configured? Disable Palm HotSync or Microsoft ActiveSync software! If you have a 1997 or newer car with an aftermarket radio or if you have used your ISO-COM Interface on a car with an aftermarket radio, read this page. If you are having difficulty while running a laptop on battery power, try powering it via a correct A/C adapter. If you are having difficulty while connected to A/C power, try running the laptop off battery power. If you are using a power supply for a laptop, it should be one specifically designed for that purpose, NOT a "universal" adapter. If you are using an inverter, make sure it is a proper one without ground loop issues..
Start>Run>MSINFO32.EXE to bring up the System Information utility. Go to Hardware Resources>IRQs This should show a list of all devices by their IRQ, so you can see if there are any repeated or shared IRQs. If all else fails, feel free to call or email us, making sure to provide the brand and model of vehicle, brand and model of PC, and version of VCDS. 2.5 VCDS communicates, but it's "flaky". Power Management -- some laptops are notoriously difficult, try running the laptop on AC power! Logitech QuickCam - the service in Task Manager is named "lvprcsrv.exe". Right-Click on each little icon. If there's a "Disable" or "Exit" option, do it! Windows 2000 with SP1: Install IE 5.5 or SP2. Windows 95/98/Me: Pull up a task list by pressing CTRL-ALT-DEL. Kill everything except Explorer and Systray. Most versions of Windows: Start -> Run -> MSCONFIG. Take a look at what other non-essential stuff Windows is loading and disable it. STOP or remove PCMCIA Cards, especially anything made by Xircom. Some IBM brand cards are also problematic. Try turning Off your COM Port's FIFO buffers. Open the properties sheet for the COM Port in Device Manager. Select the Port Settings tab. Click the Advanced button. Uncheck the "use FIFO buffer" checkbox. Some Windows installations, especially ones that have had numerous program installed and uninstalled over the years may be hopeless. Try installing a clean copy of Windows in a different folder than the original. If you have an older, slower PC running Windows XP, try setting the Display Properties>Appearance to Windows Classic Style instead of Windows XP Style. If you are using a USB Interface, go to Device Manager, USB Root Hub, Properties, Power Management, and uncheck "Allow Windows to turn off this device to save power"
If your PC has multiple Serial or USB ports, try using a different port. If you have the Window Size on the Options screen in VCDS set to any value other that 10 (the default) try changing it back to 10 then Test, Save, and exit out of VCDS. 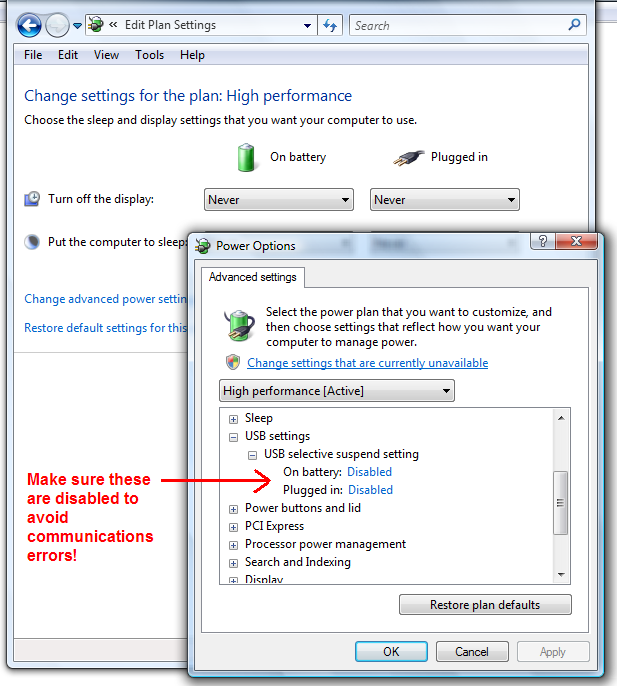 If you are using Windows Vista or Windows 7, make sure to have "USB selective suspend setting" under "Power Options" set to "Disabled" as shown here. If your PC has a Shock Sensor (like certain Lenovo laptops, i.e X61), it may shut down your hard drive under hard acceleration. You may want to disable that function in the system tray. 2.6 Why does my dash BEEP when I access my ABS controller? In many vehicles, there will be a series of BEEPs from the dash when you access the ABS controller (and the ABS light will be ON while you are talking to it). This perfectly normal and is done to notify the driver that the ABS is non-functional while in diagnostic mode. 2.7 Are there any Fault-Codes that can and should be ignored? Yes. Most 1995 and earlier Bosch ECU's will show you a DTC 00513 - Engine Speed Sensor (G28) if you scan them when the engine is not running. This fault code goes away by itself once you start the engine. If this sensor were truly defective, the engine would not run at all! Please ignore this code. In addition, many Automatic Transmission Control Modules will show a DTC 00526 or 17087 that indicates a faulty brake light switch. This can also be ignored and will not appear if you press the brakes once before checking for Fault Codes. 2.8 Are there any known Bugs / Problems / Issues? Please check the Revision History Page and Issues Page. 2.9 What's the Work Shop Code? Every VW/Audi dealer in the world is assigned a unique Work Shop Code (WSC). Whenever certain changes are made to a control module (such as Coding or Adaptation), the factory scan tool sends its WSC information to the control module and the control module records it for posterity. VCDS will accept a WSC once on the Options Screen and it is not easily changed (contact Ross-Tech if you have entered it in error). If you enter a WSC there, VCDS will send that fixed WSC to the control modules exactly how the factory scan tools do. If you leave the WSC on the Options Screen at its default of 00000, VCDS will operate in "stealth mode". Instead of sending a fixed WSC, it will put back whatever was already in the control module. When a brand new control module is installed, it may not have any previous WSC info stored, so the default setting of VCDS of 00000 may cause the control module to reject the coding. In these cases you should enter any non-zero number with the correct number of digits (such as 12345) in the WSC field on the Coding screen. 2.10 What's with the DEBUG files? VCDS uses these to record a lot of the data being exchanged between the car and your PC. Having these can be very useful if there is some sort of unexpected problem communicating with a controller in your car. By default, the Debug Level is set to 0. If you're having a problem, we may ask you to set the Debug level to something other than zero, and to send us a specific Debug file. The best way to send Debug files is to ZIP them first. Contact Ross-Tech if you need assistance doing this.